An enthusiastic crowd gathered this past Saturday to witness the unveiling of “The Greeter,” sculptor John Coleman’s gift to Green-Wood in honor of George Catlin, the father of art of the American West. The crowd that gathered for the unveiling. 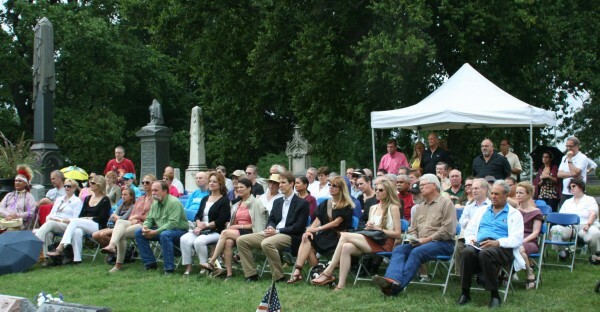 Many traveled thousands of miles for the event; several Catlin descendants also were present. For background on this event, go here. And you may read another entry about Catlin that has appeared in this blog here. 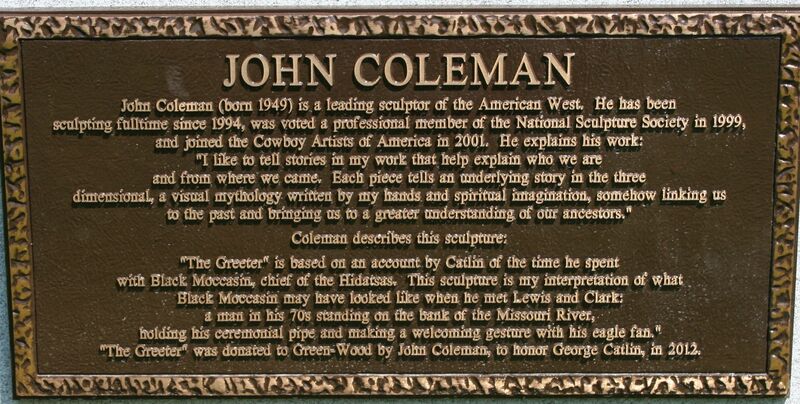 Sculptor John Coleman is a huge Catlin fan. 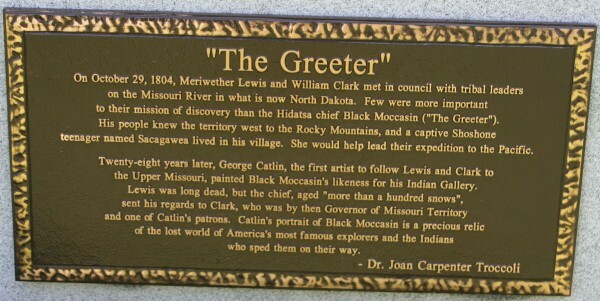 And, when he found out that Catlin, who died in 1872, had not gotten a grave marker until 1961, and that it was only a very simple gravestone in an out-of-the-way place at that, he promised to rectify that wrong. John donated his bronze sculpture, “The Greeter,” to be placed near Catlin’s grave, to honor him. 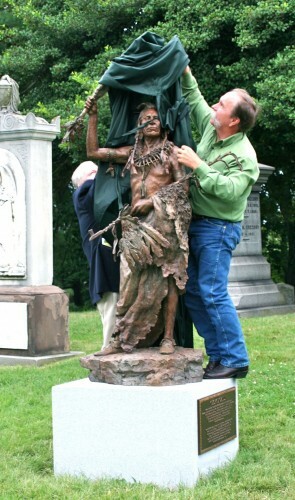 Green-Wood’s president, Richard J. Moylan, told the audience how he had met sculptor John Coleman and had arranged for Coleman donation. Dr. Linda Ferber, vice president and senior art historian at The New-York Historical Society, spoke about George Catlin, the artist. 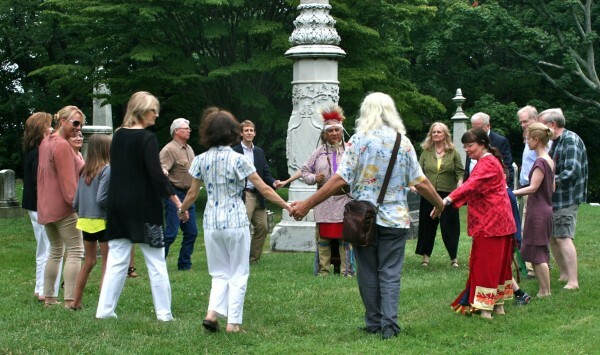 Gwen Pier, executive director of the National Sculpture Society, talked about Green-Wood as a sculpture garden and introduced sculptor John Coleman. 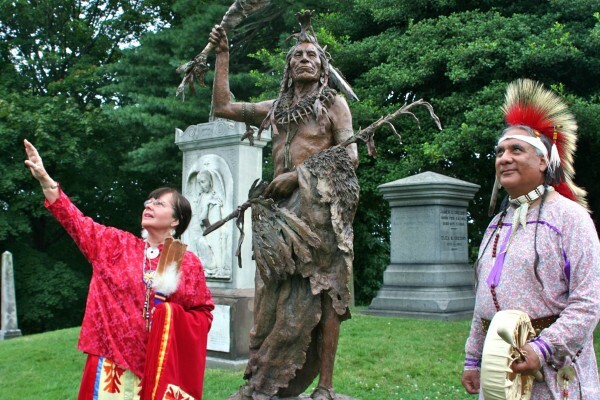 Donna Couteau, of the Sac and Fox tribes, and her husband Joe Cross, of the Caddo and Potawatomi tribes, movingly described Catlin’s importance to Native Americans–how he captured images of their ancestors (Donna is a descendant of Black Hawk, whom Catlin painted; Joe spoke of a Catlin’s painting of a Caddo buffalo hunt) and wrote extensively about their customs. 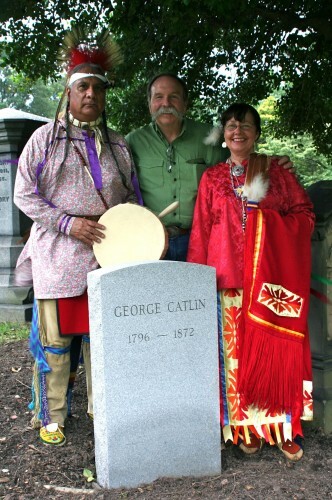 From left to right, Joe Cross, sculptor John Coleman, and Donna Couteau, at George Catlin's grave. Dr. Joan Carpenter Trocolli is a leading Catlin scholar. She kindly wrote this text. 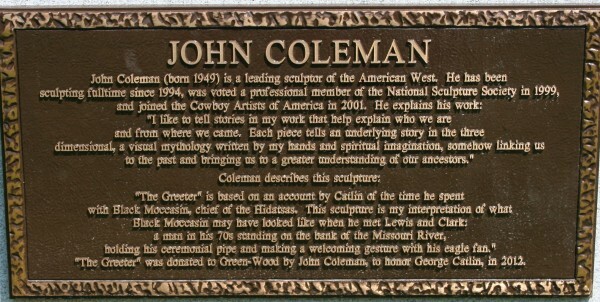 The bronze plaque about sculptor John Coleman. George Catlin gave up his career in law to chronicle, in painting and writing, the American Indian.. Here is “The Greeter,” after its unveiling, with Donna Couteau and Joe Cross. Donna spotted a heron flying by just as this photo was being taken. After the unveiling, Joe Cross led a celebratory dance in an open spot near Catlin’s grave. Dancing to celebrate the unveiling of "The Greeter" to the beat of Joe Cross's drum. After the unveiling, a birthday party was held in Green-Wood’s Historic Chapel. July 26 was painter George Catlin’s birthday; July 27 was sculptor John Coleman’s. 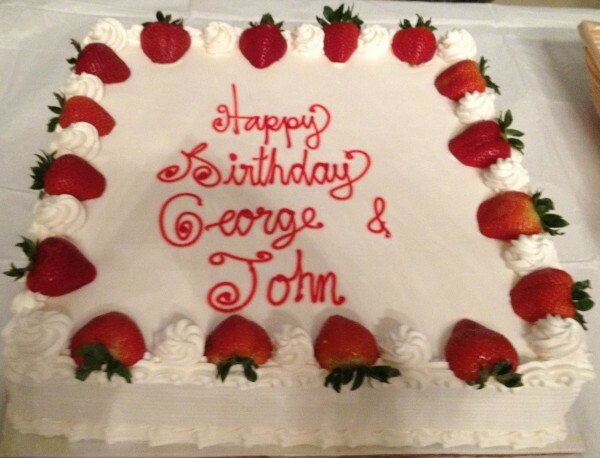 The birthday cake for George Catlin and John Coleman. 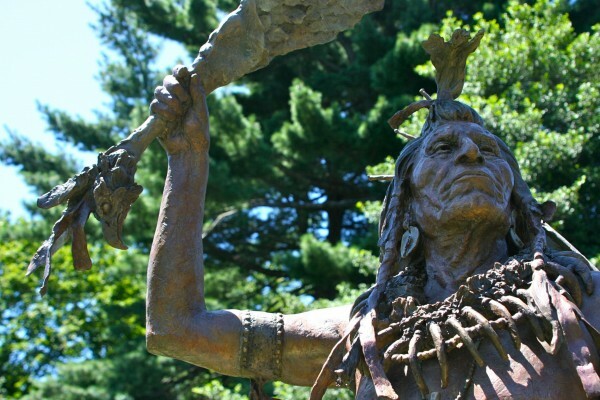 Black Hawk, Donna Couteau, George Catlin, Joan Carpenter Troccoli, Joe Cross, John Coleman.